2A is classic corporate welfare asking the voters to approve taxing themselves for the benefit of major corporations. 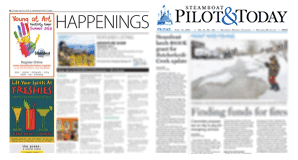 The question is whether Steamboat Springs voters fall for the threats or use our common sense. Proponents cite the benefits of tourists spending money here. What they don’t cite is that winter tourists spend most of that money on lodging and lift tickets. It is not a charitable gesture for Steamboat Ski and Resort Corp. to promise to increase their contribution to the airline flight program. It is in their self interest because they receive many times more revenues from additional customers. Their contribution should be viewed as their marketing expense. The threats of economic calamity ring hollow because Ski Corp. and the large lodging companies are not going to destroy their businesses because the public didn’t tax themselves to cover part of their marketing expenses. They will then fund their marketing campaigns including direct flights at levels that make sense for their businesses. It should not be the public’s responsibility to subsidize poorly utilized flights. Corporate welfare is distinguished by those with the money and profits asking the taxpayers to pick up the expenses that they can’t justify as being cost effective. Our local economy has slowly been shifting away from low-income, few benefits, service industry jobs to location neutral and other jobs paying, on average, nearly twice as much. In the world of economic development, this is exactly what is wanted as it is a low impact way to bring in more money to the local economy. In 2011, the last time the airline subsidy tax was approved, we were in the middle of an economic crisis. The local economy had substantial unemployment among service workers. It made sense to stimulate tourism in 2011. Now, we are in the opposite economic situation. We lack the housing for our service and seasonal workers. We approved a 1-mill property tax increase to create subsidized housing for lower income residents to mitigate the impacts of an overheated economy. It makes no sense for the taxpayers to subsidize tourism at this time. It is like fighting a forest fire only for someone to propose we all chip in to buy cases of lighter fluid. It is a plan to worsen local problems of housing and congestion. Vote “no” to corporate welfare. Vote “no” on 2A.